Lacking the conventional story/spin about how this cigar’s creator smokes said cigar as his personal blend; or how La Barba made this cigar to bring a specific [insert varietal] to the market; or any of the other customary tropes; La Barba Cigars debuted the One and Only Super Toro in 2018 as a followup to the company’s 2016 limited release of the same name. According to company owner Tony Bellatto at the time of the cigar’s announcement, the One and Only Super Toro contains an average of 10-years’ age, with tobaccos stemming from five countries. The original La Barba One and Only was released at IPCPR 2016 in a singular Toro Extra format, becoming the brand’s first limited-edition offering. This cigar made use of an Ecuadorian Habano wrapper over an undisclosed filler recipe of “very well aged” tobaccos. The cigars featured unique artwork as well, showing a rendition of Tony Bellatto in the guise of fictional character Sweeney Todd—a play on the company’s own razor-inspired branding. One and Only Super Toro shares many of these themes, using a similar wrapper and vintage leaves throughout. The cigar boasts a larger format, limited production (20,000 cigars), and updated artwork that is now inspired from Medusa imagery. Redwood. That’s the first thing I think of when I am presented with a cigar of this stature—this is an absolute unit. The somewhat veiny, ever-so-lumpy, minutely mottled Colorado/Rosado wrapper is quite attractive, with a fine sheen of oil that almost seems to moisturize the fingertips (dancing in dangerous territory here). This cigar is heavy and very densely packed, forewarning of a long smoking experience. As for the artwork, I don’t really find a connection with the band. It’s a rendition of La Barba Cigars’ founder Tony Bellatto with snakes coming out of his hair and beard. Why, I can’t quite understand, other than perhaps the artist going by the name Medusa. This is in contrast to the quick connection made with the cigar’s predecessor. Pre-light aroma has loads of leather and barnyard combined to give the toro that saddle smell upon first whiff of the wrapper. Then comes nuts and dried banana. The foot is a chocolate mole blend of spicy and savory cacao. I’m surprised at how open the draw is, considering how dense the cigar feels in the hand. Using a V-cut, the cigar clocks in at just a notch on the open side. The smoke output at the beginning is very frustrating. I simply don’t have enough puffing power to get enough smoke traversing through this much cigar without double/triple-puffing. That is not how I like to smoke a cigar, puffing away like a maniac, trying to get a mouthful of smoke. Anyway, there’s some pretty exceptionally fruity notes here early on. This is followed by what I consider the closest I’ve come to tasting actual barnyard—not just something reminiscent of barnyard, but like actual getting-drunk-and-falling-face-first-with-an-open-drooling-mouth-in-the-barn barnyard flavor… Somehow it’s not unpleasant. There is lots of sweet creaminess in the flavor profile, too. I’m sure my constant triple-puffing doesn’t help much in terms of burn or flavors, but I’m playing with the hand I was dealt. There is a pretty mild pepper note in the mix, but not a whole lot else happening. It’s good, but it’s not really going anywhere at this point. Strength is medium-light, body is on the lighter side (with the frustrating smoke output), and flavor is medium (and potentially building). At the point that I deem the beginning of the second third, the forerunner in the flavor department is a super rich creaminess. This might be one of the creamiest cigars I’ve smoked in some time; at least at this point. A tangy mineral flavor creeps in as the burn finally gets bad enough to warrant a touch-up. Meanwhile, the cigar still asks for multiple puffs to get a mouthful of smoke; in other words, it’s still frustrating at the halfway point. The flavor profile has shifted away from the intense, rich creaminess (sadly), and now is driven by cedar and tangy green herbs (ever tried woodsorrels?). There are fleeting moments, somewhere in the multiple puffs to get a mouthful of smoke, when it seems like it’s going to come together into something really nice, but then the triple-pump-puff heats the smoke up and it shoots right past that magic point. Things are getting a little better nearing the secondary band. As the cigar has gotten shorter, the number of priming puffs to get a full draw has lessened, and smoke output is slightly increased. Less puffing means less heat means (slightly) less sour herb notes and a reintroduction of the creamy flavor that gives the One and Only kind of a lemon mascarpone cheesecake character, at its best. Although less frequent, the extra puffs are still required, which means this is kind of a hit-or-miss experience (with more miss than hit). Cedar. Sour herbs. Occasional moments of cohesion. Wait—there’s some smokey oak, walnuts, savory meat char… no, wait, sorry… back to the tangy cedar again. Another hour goes by and I finally put this down with still over an inch to go because I’m flat-out bored. This cigar is a tale of two construction problems. In one sample, I had to repeatedly take multiple puffs to get smoke to my mouth, with a somewhat light draw that really heated the cigar and kind of destroyed the flavors. The other was so overstuffed that it was like trying to smoke a tube of compressed wood. After finally creating air passage, I was able to enjoy it, although with a still overly tight draw. The tight version had a better showing than the loose version, with a lot more character and consistently better flavor, but tight cigars are my absolute pet peeve. Even after using a PerfecDraw tool, it was still tighter than I wanted, and given the massive size, I don’t think I could have gotten it dialed in just right. With one sample being frustrating and not tasting quite up to par, and the other tasting pretty good but being even more frustrating, I’d pass on having another of these. I could just ramble on and on about how I didn’t like the size of this cigar, but I'm trying not to let my personal preferences play a major role. 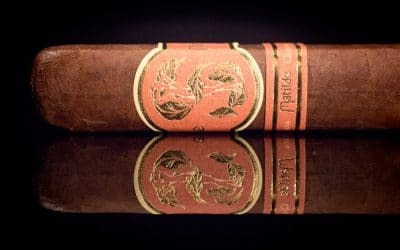 But I think I can say objectively that there are faults in this cigar that might not have existed had it been rolled in a different (smaller) size. I love baseball, so I’m going to draw a parallel for you here. If you’re a good gap hitter with speed, you slap the ball around and get on base, maybe hit a double—you can score some runs. This is good, but chicks love the long ball, right? So you start trying to uppercut your swing in an attempt to get the ball up in the air. Problem is, all you’ve got now is warning-track power and you’re striking out all the time. Now, you’re just an easy out who occasionally gets a home run. All that is to say (non-baseball fans can pick back up here) that I think this cigar has real flavor potential, but falls victim to its flawed approach at beefiness. Given the inconsistencies I experienced, and the potential for it being flavorful, I can't side completely against this cigar—it just didn’t work for me.